Take some deep breaths ND Nation. This is just a rumor. I repeat it's only a rumor and has not been confirmed by anybody in the Notre Dame athletic department. But according to a poster on Reddit who claims inside information Notre Dame will come out in green jerseys (pictured above) for the FSU game on November 10th. "I was told before the season started by a friend of mine who is close to the team that ND has green jerseys in their possession and that they were very similar to the men's green basketball jersey's in color scheme. He said BK let the team decide whether to wear them for the Michigan or FSU game. He told me they were the normal home/away ND jersey template just with green on it and the picture above matches that description perfectly. I'm not sure if this picture was posted to the website by accident, but they may have leaked something they didn't mean to." I will admit this worries me because I too am a ND fan. I know the recent history of ND coming out in green jerseys and it's not pretty. I'll never be able to burn away the images of Ryan Grant and Pat Dillingham fumbling away an undefeated season in 2002 vs Boston College in the green jerseys at home during the Ty Willingham era. I'll never forget the green jerseys worn at home vs USC in the Bush Push game and then in the disastrous 2007 season with Evan Sharpley at QB that both resulted in losses, the later a 38-0 drubbing. Also sprinkle in some Michigan "Under the Lights" games where the Irish came out on the losing end and it doesn't leave a happy, good luck irish green feeling among ND fans. On the bright side Dan Devine loved the color green for ND when he was head coach in the late 70's and even won a Natty with Joe Montana sporting the famous green #3 jersey. But since the Devine era when ND went back to their traditional blue and gold jerseys the Fighting Irish are 7-6 when sporting green jerseys. The good news is they beat Maryland in the 2011 Shamrock Series and Boston College in the 2015 Shamrock Series games while wearing green jerseys but both were ugly wins. Just reading the tea leaves I think ND will come out in green jerseys vs FSU to mark the silver anniversary of the "Game of the Century." The #7 green jersey pictured above aka Brandon Wimbush green jersey is currently a hot seller at the ND bookstore and he's not even starting anymore with Ian Book leading the nation in completion percentage while going 4-0 this season as the starter. There were rumors ND was gonna wear green vs Michigan in the season opener of the #IrishWearGreen campaign to turn ND stadium into a "green out" but it didn't happen so now what do you do with all these green jerseys that Under Armour made? You wear them vs FSU. Just go ahead and book it. 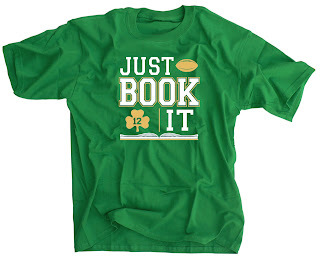 Order "Just BOOK It" T-shirts Here!